Venezuela's oil exports ground to a halt, negotiations stalled and protesters faced off on the streets as prospects dimmed for a peaceful resolution to a strike designed to unseat President Hugo Chavez. After withstanding three days of the nationwide strike with few visible problems, the world's fifth-largest oil industry descended into chaos Thursday. Captains anchored their tankers offshore, tugs stopped towing and dock crews stopped loading oil and natural gas. Acknowledging it couldn't fill orders, Venezuela's state oil monopoly freed buyers and sellers from fulfilling their contracts, said Jorge Kamkoff, a vice president of the company. Crude oil futures at the New York Mercantile Exchange rose as the crisis deepened. The Energy Ministry admitted for the first time that oil loading was being delayed, but claimed all plants were operative. A top Venezuelan oil official met with representatives of the U.S. Embassy to reassure them about long-term supply. Chavez vowed to use the military to protect the industry, which accounts for 75 percent of exports and half the government's income. Both sides warned of violence as Chavez supporters and strikers demonstrated in separate rallies in eastern Caracas. National guard troops blocked roads and bridges between the two demonstrations, preventing clashes. Violence between the two sides killed 19 people during a similar strike on April 11. Dissident officers deposed Chavez the next day, but loyalists restored him two days later after an interim government abolished the constitution, triggering a popular rebellion. Resentment over the April revolt still runs deep among Venezuela's polarized people. Peace talks led by Cesar Gaviria, secretary general of the Organization of American States, broke down on Wednesday just as the two sides were finalizing an agreement to end the strike, withdraw the army from the streets and let courts decide on a proposed referendum over Chavez's presidency, a source close to the talks told The Associated Press. There were no negotiations Thursday. Gaviria has become a lone conduit between the two sides, and officials fear the crisis would descend into violence without his presence, the source said. "We're living a kind of civil Cold War, because we haven't taken to arms yet, but to move from cold to hot all you need is a single badly aimed gunshot," said political analyst Alfredo Keller. "We are moving toward violent confrontation." The oil industry began to come apart Wednesday afternoon, when the captain of a tanker announced he had anchored his ship — complete with 280,000 barrels of gasoline — off the western city of Maracaibo. By Thursday night, at least six other captains had done the same. 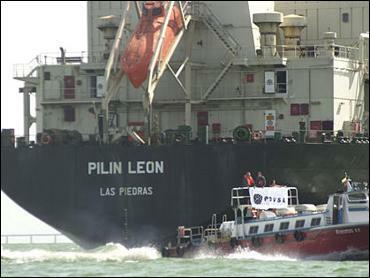 The fate of the Pilin Leon, the tanker that began the rebellion, was unclear. The government said it had seized the ship, but First Pilot Javier Colina said navy officials who boarded told the crew they would look for replacements for the sailors, then left. Tugboats in Maracaibo Lake, where 1 million barrels of crude are produced daily, joined the strike, refusing to bring ships into port, according to a worker at the largest tugboat company there, who spoke only on condition of anonymity. All workers at shipping terminals stopped loading tankers, said shipping agent Jesus Cabrera. Another shipping agent, who spoke only on condition of anonymity, said exports from all ports in Venezuela stopped as of 3 p.m. Thursday. The agent said he had spoken with officials in Caracas and managers at all major docks. Evidence of the shutdown began to emerge outside Venezuela. Marine officials in Curacao, where Venezuela's oil company operates a refinery, said two tankers scheduled to arrive from Venezuela didn't show up Thursday. Chavez called the anchoring of the Pilin Leon "an act of piracy" and said he would use the armed forces to keep the oil industry operating. He accused strike leaders of seeking to privatize the Petroleos de Venezuela S.A. oil monopoly, known as PDVSA. "Assaulting PDVSA is like assaulting the heart of Venezuela," Chavez said in a nationally broadcast speech. "Nobody stops Venezuela." Last year, the United States imported 471 million barrels of Venezuelan oil, comprising over 13 percent of its total imports. It ranked fourth among U.S. suppliers, behind Saudi Arabia, Mexico and Canada.